Blueberries are sweet fruits having several health aiding properties. Blueberries are perishable and hence are spoiled easily. To preserve blueberries and to use it in several applications, blueberries are dried to remove the water content. The removal of water content extends the shelf life of blueberries and also enhance the nutritional aspects and flavors of the berries. 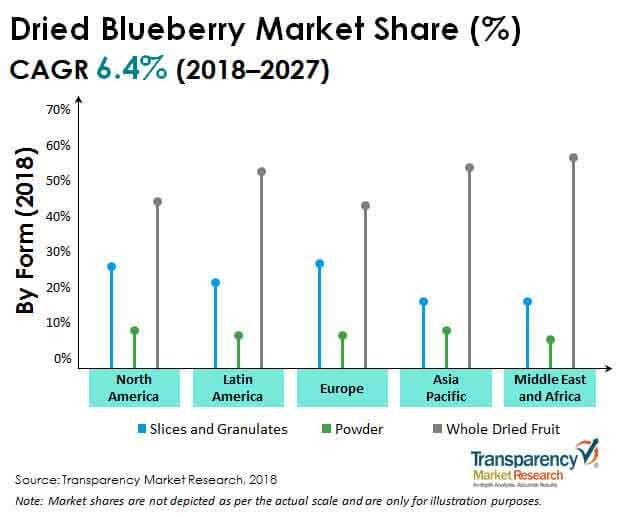 In terms of value, the global dried blueberries market is expected to reach US$ 658 Mn by the end of 2027, with an anticipated CAGR of 6.4% over the forecast period. The drivers for the growth of the dried blueberries market include growing health and wellness consciousness, increasing snacking trend, increasing application of dried blueberries in bakery goods and confectioneries, longer shelf life, increasing E-commerce, and product launches using dried blueberries as an ingredient. Health and wellness consciousness attributes to changing consumers' dietary pattern and eating habits. The consumers are ready to pay a premium price for products and ingredients that are healthy and have high nutritional content. Healthy eating categories are growing at a much faster rate as compared to the indulgent categories. These factors are leading to the growing market for dried blueberries. Dried blueberries are known as superfood of modern-day owing to its health benefiting properties due to the presence of flavonoids and phenolic acids content in the fruit. Dried blueberries aids in obesity, retinal injury, diabetes, inflammations, cognitive decline, and bone loss. The increasing health benefiting properties of dried blueberries is resulting in the growing demand for dried blueberries. The increasing snacking trend and growing demand for the convenient snacking option are leading to the growing market for dried blueberries. The growing urbanization and hectic lifestyles have made consumers opt for convenient and healthy snacking options. The demand for dried blueberries is increasing as a potential meal replacement and snacking option either as a whole dried fruit or an ingredient in other snack foods. Dried blueberries are used in cereals and snacks bars, confectioneries, yogurts, cakes, biscuits, and other snacking food to meet the growing consumer demand for convenient snacking food. Dried fruits and ingredients like blueberries are perceiving an upsurge in demand attributed to the technologies being used for their production. Methods and techniques including solar drying, vacuum drying, microwave drying, and freeze-drying have extended the usage of dried blueberries for a more extended period. Drying helps to preserve and enhance the shelf life of the blueberries helping the manufacturers and consumers to use the dried blueberries for a more extended period and provide broader prospects for the application of dried blueberries. The increasing demand for high-value bakery products that offer nutritional benefits is leading to the growing demand for dried blueberries. The manufacturers are using dried blueberries in confectioneries and bakery products to provide consumers with innovative taste profiles and flavorful food. Besides, the increasing product launches of bakery goods and confectioneries with dried blueberries as a potential ingredient is attracting larger consumer resulting in the growth of dried blueberries market. Awareness and carefulness regarding consumption are currently moving to the idea of deep-seated transparency. With increasing technology, consumers now have access to smart labels, through which they can track the journey of the products and check them against their individual qualities. Consumers are nowadays asking food companies to increase the transparency of their products, going past ingredients, free-from status, and nutritional levels. This is driven by the buyer's ever-increasing demand to understand the product’s background – from where and how the ingredients were sourced, till the end product. Thus the increasing demand for clean label products is leading to a growing market for dried blueberries. The global product launches with blueberries as an ingredient is witnessing robust growth. The dried blueberries are used in the formulation of flavored drinks, desserts, frozen yogurts, fruit cups, energy drinks, and others. The increasing product launches are anticipated to attract a large consumer base thus resulting in a greater market opportunity for the growth of dried blueberries. Electronic technologies are continuously and increasingly deployed throughout the supply chain of dried blueberries. E-commerce has become an important platform which has benefited both manufacturers and consumers. The manufacturers of dried blueberries can promote and sell their product on a global platform and can connect with a much broader consumer base through online retailing. Besides, consumers are also getting benefited from the growing E-commerce in the supply chain as the consumers have greater accessibility to the products. Consumers have the transparency to compare the products and their prices at the same platform providing them ease of decision making. The growing E-commerce is thus leading to an increasing market for dried blueberries.